This is what is showing up for members (http://prntscr.com/m9ftew) "Nothing to update. You have NO recurring fees. Or, your billing profile is no longer active. Please contact Support." When I look at the user profile, the stripe customer ID and subscription ID are in there and they are being charged monthly. I can confirm that those IDs (both the subscription and customer) are correct, and for this customer. I've reviewed this customer and her payments and there isn't any billing information being sent to us from the plugin. If this is the information that you would like to collect then I would suggest reaching out to the plugin developers directly to see if they can start collecting those pieces of information. Just some ideas to troubleshoot here - did your API somehow get messed up with Stripe when you made the changes? Maybe go in and make sure that S2 is "talking" to Stripe properly. Then perhaps check your Stripe settings that the API matches the one you enter on S2? I have already checked this. The API's and webhook are perfect and using the correct one. Have you had a chance to check on the server side whether there are some settings they have preventing this? I meant with your host - to bring it up with them perhaps? Were those subscriptions created with s2Member? 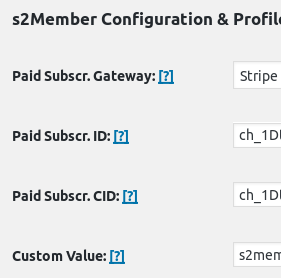 Does the user profile in WordPress, in the s2Member section, have Stripe as the payment gateway, and the subscr and customer IDs, and the custom value for your site? Thank you for your all reply. I have checked with them. There's nothing block at there. Then we need to troubleshoot a bit more. We need to reproduce the problem with logging enabled. Could you enable logging, reproduce the problem with a test user, and show me the log entries? The test subscription doesn't have to be full price, a couple cents should be fine. I created a new user myself this morning to see if I had any problems with unsubscribing/updating/upgrading and I did not have any issues. I am trying to see if one of my old members can check her account to see if she is still having trouble. It seems like it is members prior to the Stripe problem we had with the moving of servers. Let us know if you want to check our staging server for check the setting and run some test? Yes, I'd like taking a look if that's possible. You can send me the login details in a private message here. Also tell me which of the accounts have been having this behavior, and some examples of others that are okay. Done. Just sent you a message after reviewing what you sent. The issue is resolved, subscription and customer ID was miss matched on the Stripe and user settings. Need to change those manually. Thanks for the udpate! Glad I could help.